The main reason I registered for this Sunday’s Leesburg 20k is because the timing of the race fits my half marathon training plan perfectly. My training plan calls for me to run 14 miles this weekend, and its my last long run before I run Rock ‘n’ Roll Virginia Beach on August 31st. Knowing that I’m scheduled to run 14 miles, when I realized that the Leesburg 20k was scheduled for the same weekend, I started considering whether or not I should register for this race. A new race distance, an opportunity to run in a new location, and the chance to race instead of just setting out to run 14 miles on my own all appealed to me. Although a 20k is only 12.4 miles, I figure that on most race courses I don’t run only the specified distance, that registering for this race would be a great way to complete this weekend’s long run. And if I’m feeling good after the race, I’ll run the last mile to fully complete 14 miles. I’ll also be using this weekend’s race as a trial for my current goal finish time for Rock ‘n’ Roll Virginia Beach. Although this weekend’s course is much hillier than the course in Virginia Beach is, I’d still like to test myself and determine if my goals for Virginia Beach need to be altered. Its also supposed to be hot and humid on Sunday morning during the race, which in addition to the hilly course is another factor I’m taking into consideration. QOTD: Do you ever use races as a test run while training for a milestone race? 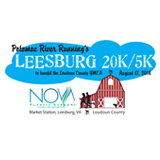 This entry was posted in Races and tagged 20k, goal, goal setting, Leesburg 20k, running. Bookmark the permalink. Its definitely something different, which is part of what was appealing about this race. Sorry to hear that you’re still not 100%. Hope you’re fully back at it soon! Good luck with the 20K! You’re going to do great. Those are some solid time goals and I predict you will beat them all! Thanks! I’m definitely trying to balance being realistic/not pushing myself too hard before my half/using this as a good test for my half. Good luck!! I am sure you will rock it! I have used races before to see where I am before a big race!! You can’t beat having a training run and getting another medal out of it:) I thk I am using my Va Beach one for my training run. I hope to do Philadelphia the following mth to get the beach to bell medal. And it’ll be a bit cooler up there so I will have that as an advantage. Absolutely! I wish I could get a medal for every long training run I do. i am looking forward to meeting you this sunday at the race! woohoo!! Goood luck! You will do great 🙂 I am using this as a training run – nice and easy for the first 6 miles then goal paces last 6 miles. Look fwd to seeing you on Sunday!! Looking forward to see you as well!